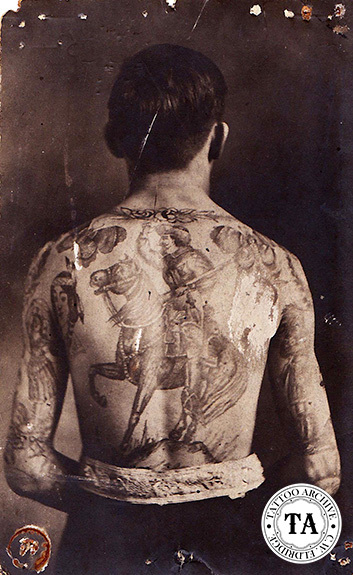 William Frederick, "Buffalo Bill" Cody, was one of those larger-than-life characters from American history, whose likeness has worked its way into the tattoo world. Cody was born in 1846 near what is now known as LeClaire, Iowa. At the height of his popularity Cody was considered the most recognizable celebrity on earth. The story of his eventful life has been told in books, movies, television shows and stage plays. Cody's image was also featured on two postage stamps. 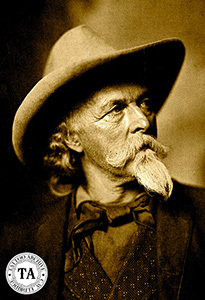 The story goes that there was a time when Bill Cody and Bill Comstock shared the name "Buffalo Bill." Bill Cody earned his nickname for the number of buffalo's he had killed to feed the workers of the Kansas Pacific Railroad. Bill Comstock, born in 1842, earned his title on the Kansas plains as a scout and interpreter at Fort Wallace. He was a scout for General Sheridan and General Custer and was also known as the "Ace of Scouts." This name confusion could not stand, so the men arranged a buffalo hunt contest near Monument, Kansas with the winner getting $500 of prize money and the naming rights to "Buffalo Bill". It is recorded that Bill Cody won the contest by killing 69 buffalos' to Comstock's 46. Although Bill Cody's exploits in the Wild West was the stuff of legends, today he is best known for his show business ventures about his life and his Wild West shows. 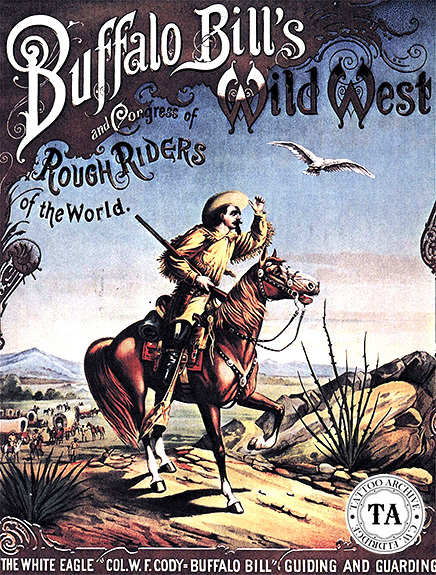 Bill Cody's stage debut was in 1872 in Chicago but 1883 is the year given that the Buffalo Bill Wild West show was born. Traveling by rail the show carried hundreds of performers and horses and staged re-creations of events that had won the West. These shows crisscrossed America and Europe and were wildly popular around the turn of the 20th century. The Wild West shows were set up much like a traveling tented circus. The main entrance with ticket boxes was at the front of the show lot, and often there would also be a sideshow. While the Wild West show patrons waited for the doors of the big show to open, the sideshow would grind into action. It was behind those banners that the tattoo attractions made their living. 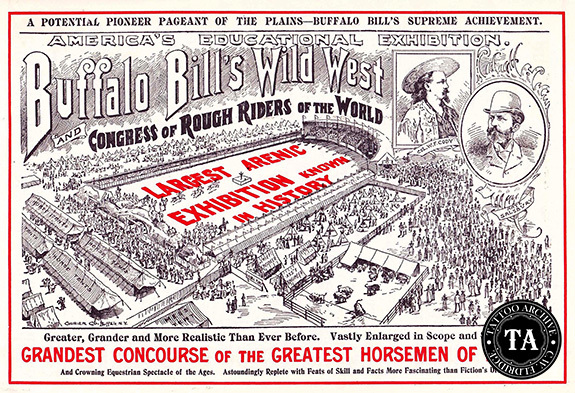 Throughout the years several tattoo attractions worked with the Buffalo Bill Wild West show. The earliest record we have is of Capt. Walters, billed as "The Blue Man" in 1896. Cody kept his show in Europe from 1903 to 1906 and during this period Harry Keigel traveled as the tattooed man. An obscure tattoo attraction named W. Denny was with the show in 1911. Bert Grimm worked with the show for one short season in 1916 and in a 1977 interview with the Willamette Week had this to say about that time. "One day not long after I opened my shop in Chicago, this old guy with a western hat came into my shop. He had long grey hair. He looked over my work and liked it. He asked if I was free to travel with his show right away because his present tattooist was leaving, He introduced himself as William Cody. Was I ever shocked! I spent the whole summer traveling with Buffalo Bill's Wild West Show. I was part of the 10-in-one sideshow. That's where the customers pays a quarter admission to see 10 shows under one tent. I exhibited my tattoos and there was a shill who lectured about me. His story was that I had been shipwrecked on a cannibal island and forcibly tattooed by the natives. I also did tattoos for 50 cents and a dollar. On a good day I made $10.00." Buffalo Bill Cody died that offseason, on January 10, 1917 at his sister May Cody Decker 's home in Denver Colorado.